Yes! There’s some tuna out there. 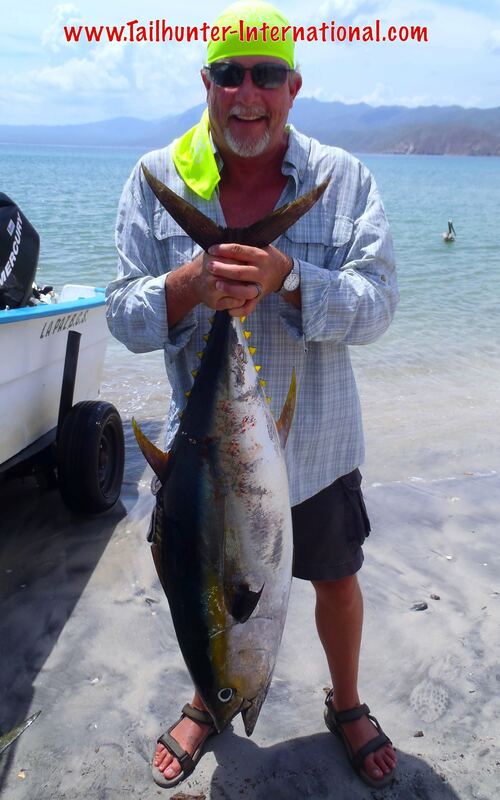 Rick Wagstaff from Delta UT, on his first day out fishing with us wrestled this tuna on light tackle for almost an hour at the south end of Cerralvo Island. 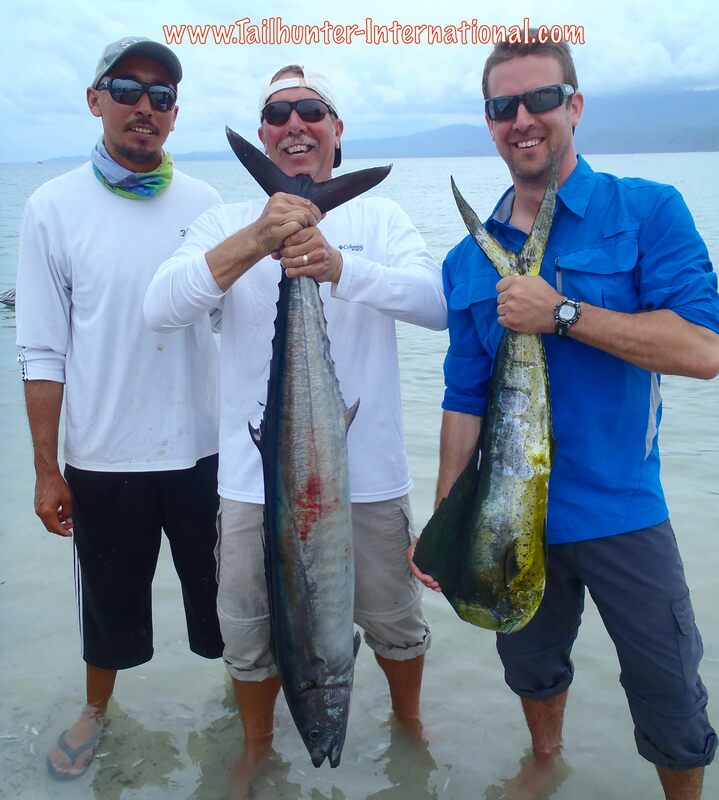 Rich was fishing with our Tailhunter Las Arenas fleet from Muertos Bay. He also got a limit of dorado as well. Bob Patterson from Los Angeles and his son, Travis from Sacramento had a good week of fishing, but on their last day the bite was off. Not much happening. But then they were headed back in and decided to put all 4 trolling feathers out and ended up getting a big 40-pound class wahoo! Captain Pancho here with them. They also got a few dorado, but the rest of the week limited on dorado. You gotta check out this great video from Larry Barnard of Los Angeles CA who was recently with us. He did a great editing job of some big roosterfish hookups with some super underwater clips as well. Good job, Larry! A good solid week of fishing as the kids here in La Paz head back to school and the town quiets down. A little cooler this past week, not quite so muggy with some brief afternoon thundershowers but otherwise sunny and warm skies and water. Everyone who wanted fish got fish…a good thing! It’s been awhile since I’ve lead our reports with Las Arenas/ Bahia de los Muertos. Regretfully, our traditional hot spot has had an off-year with lack of bait leading to spotty fishing or southern storms making for rough waters for our pangas and clients. However, things are really turning around…happy to say. Two things. We’re finally getting some bait showing up. Sardines…our lifeblood for fishing are being found. Plus, we also getting some mackerel, caballitos and ladyfish (for the roosters). Secondly, about 2 weeks ago, the sportfishing captains put several dozen buoys just offshore to act as fish attractants. Just to try to get things going. It appears to be working. Every one of our boats this week took limits or near limits of dorado. School-sized, but nonetheless great action with the largest fish running about 15 pounds and others breaking off. The fish are being found at the buoy and lighthouse. There was really only one “off-day” when the fish didn’t bite well and that was because it was “too calm.” Yes, there is such a thing. Folks, especially first timers, tell me all the time they are worried about the big waves and rough seas and I tell them that the Sea of Cortez is often like a big lake. Plus to get fish, we don’t have to go out very far and we’re also not trolling for fish a zillion miles offshore. Well, one day this week the water was like glass. Literally. Wonderful day on the water. Just flat flat flat. And the fish were really stubborn! You see, you want just a little current. You want just a little breeze. It stirs up the water. It moves bait and nutrients. It gets the gamefish going. It’s like a hot muggy day on the porch. The last thing you want to do is move. Too hot to eat. Too humid to think or want to do anything. Same with the fish. That day the fish just weren’t real active. But, fortunately, that was only one day. The lighthouse has also been the site of some deepwater yellowtail and trophy cabrilla and some amberjack as well. Surely a hotspot this past week. We’ve also been getting rooster fish and billfish hookups in the same area. The bigger news was that tuna have moved into the area. The East Cape just to the south of us encountered the tuna schools a few weeks ago and we were hoping the fish would be moving up. This past week, we did get into a few that ran about 40-50 pounds. A great grade of fish and about the size that most anglers can handle! The commercial guys got into a few more so we’re keeping an eye on that and got our fingers crossed. Again, just like in previous weeks, this is our go-to spot! If you only have one day to fish, or you want a sure thing, you can’t miss with the dorado just straight on in the bay and just outside. Limits are pretty typical and some days the pangas are back by 1 p.m. (which means they stopped fishing before noon!). This has especially been great for first-timers, families and couples and kids. Everyone has fun. With the dorado, there’s also tough larger bonito, jack crevalle, smaller rooster fish plus shots at billfish. 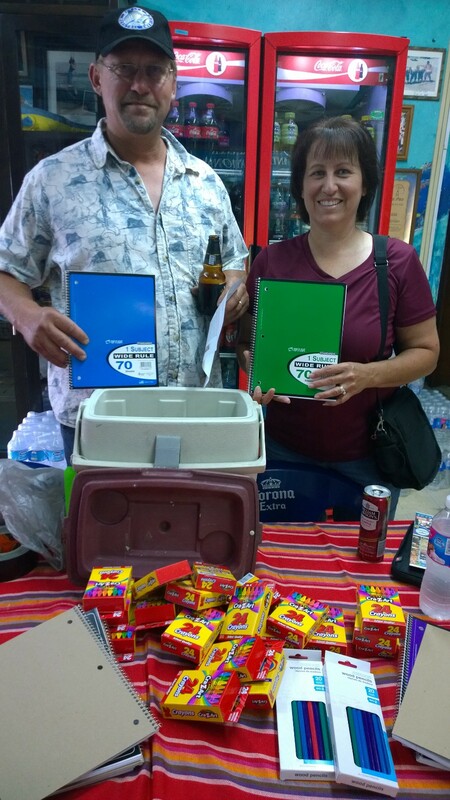 Thank you this week to Bud and Lisa Wagner who are fishing with us for the first time, but still brought down for our “Pack for a Purpose” kids with a whole bunch of great school supplies. Thanks for the big hearts, amigos!